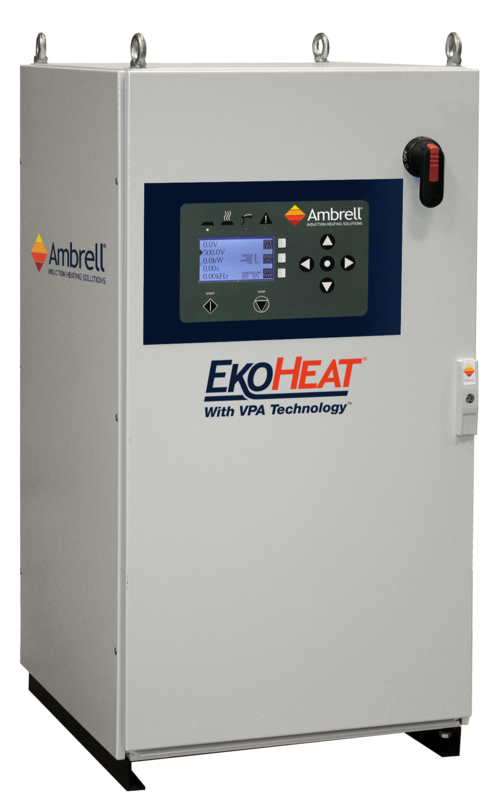 Ambrell, a leading source of innovative applications of induction heating, today launched its next generation EKOHEAT® products, featuring Versatile Performance Architecture (VPA) Technology. A first-of-its-kind in the industry, the EKOHEAT product line with VPA TechnologyTM makes induction processes easy, safe and serviceable. EKOHEAT VPA integrates into manufacturing systems or performs as a stand-alone induction heating solution. The AUTOSCAN capability allows the user to expand the use of the product beyond its current application. With auto-scan, EKOHEAT VPA includes easy-to-use functionality to scan a new application and auto-set the starting frequency and then recommend RF setup parameters. EKOHEAT VPA products include soft start circuitry. This safety feature eliminates the risk of tripping up other equipment when a power supply is turned on. System power is tightly controlled on start-up to minimize transient spikes and electrical noise. EKOHEAT VPA is built using a universal printed circuit board (PCB) that can be used across the entire product line. This means fast availability of service repair and replacement parts assuring business continuity and long-lasting product life. Regardless of system size and frequency, common PCBs are integrated into the design of EKOHEAT VPA products. A single board-set addresses multiple EKOHEAT VPA systems, thereby minimizing inventory and eliminating model-specific versions. EKOHEAT VPA is enabled for remote diagnostics and data collection with industrial Ethernet communication capabilities. In the industrial and automation environment, networking is fully supported using EKOHEAT VPA’s chosen gateway and includes CIPs (Common Industrial Protocols) such as EthernetIP, Modbus/TCP, and PROFINET protocols. For additional information call +1 585 889 9000 or visit the Ambrell website at www.ambrell.com.